Extremely rare British Admiralty chart of the Savannah River. America East Coast Savannah River & Calibogue Sound from the United States Coast Survey 1855 with additions & corrections from survey of 1862. A beautiful and extremely scarce 1861 British Admiralty Hydrographic Office maritime map or nautical chart detailing the Savannah River and Calibogue Sound, Georgia. 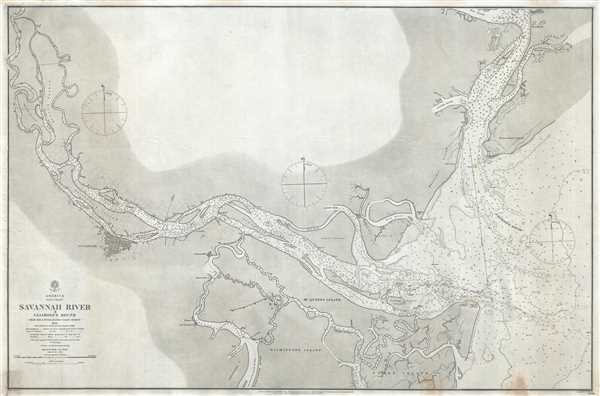 Centered , the Savannah River, this map covers the Calibogue Sound coast from Hilton Head Island to Tybee Island with extensive detail along the inland course of the Savannah River as far as Argyle Island. They city of Savannah is featured prominently on the Savanah River just west of center. The city itself is rendered in considerable detail with individual streets identifiable. This chart hails from an era when the British Admiralty produced the finest nautical charts in the world. The present is derived from U.S. Coast Survey work in the Savannah River region dating to 1855 with updates form the 1861 survey. Captain Washington, of the British Admiralty, further updated the chart to 1866, with minor revisions to 1873. This chart is very rare, with no other examples identifiable. The British Admiralty Office (1795 - Present) or the United Kingdom Hydrographic Office refers to the Branch of the English government that is responsible for the command of the British Navy. In 1795 King George III created the United Kingdom Hydrographic Office, known in short as the U.K.H.O., to provide top notch nautical charts to the vast Royal Navy. Prior the founding of the Admiralty the surveying and creation of nautical charts was primarily a commercial venture wherein the cartographer himself, more of than not, actually financed the printing of his own material. The great navigator Cook himself is known to have scrambled for funds to publish his own seminal charts - the most important and advanced of the period. The system of privately funded nautical mapping and publishing left vast portions of the world uncharted and many excellent charts unpublished. King George III, responding significant loss in trade revenue related to shipwrecks and delay due to poor charts, recognized the need for an institutionalized government sponsored cartographic agency - the Admiralty. The first head of the Admiralty, a position known as Hydrographer, was the important cartographer Alexander Dalrymple. Dalrymple started by organizing and cataloging obtainable charts before initiating the laborious process of updating them and filling in the blanks. The first official Admiralty Chart appeared in 1800 and detailed Quiberon Bay in Brittany. By 1808 the position of Hydrographer fell to Captain Thomas Hurd. Hurd advocated the sale of Admiralty charts to the general public and, by the time he retired in 1829, had issued and published some 736 charts. Stewardship of the organization then passed to Rear Admiral Sir Francis Beaufort. It was under Beaufort's administration that the Admiralty truly developed as a "chart making" as opposed to a "chart cataloging" institution. Beaufort held his post from 1829 to 1854. In his 25 years at the Admiralty Beaufort created nearly 1500 new charts and sponsored countless surveying and scientific expeditions - including the 1831 to 1836 voyage of the H.M.S. Beagle. By 1855 the Admiralty's chart catalog listed some 1,981 charts. Very good. Minor stain, lower right margin. Else very clean.